Musa ‘Mekong Giant’ PP24315 is a giant growing cold hardy banana from Yunnan China. The plant can grow in idea conditions to 40 feet tall or more. The pesudostem (trunk) will get a dark pink to purple color with age. I have over wintered this plant in the ground for over 9 years. It will produce very large clumps of bananas so give it plenty of room to spread out. The flowers are also extremely large 1 to 2 feet long and are used in cooking in China. I have grown and treated this plant much like Musa basjoo for the past few years and it has shown to be a just as fast in returning for spring and can easily out grow basjoo given the right conditions. It can grow in full sun as well as shade it is found in habitat as an understory banana in shady forest. 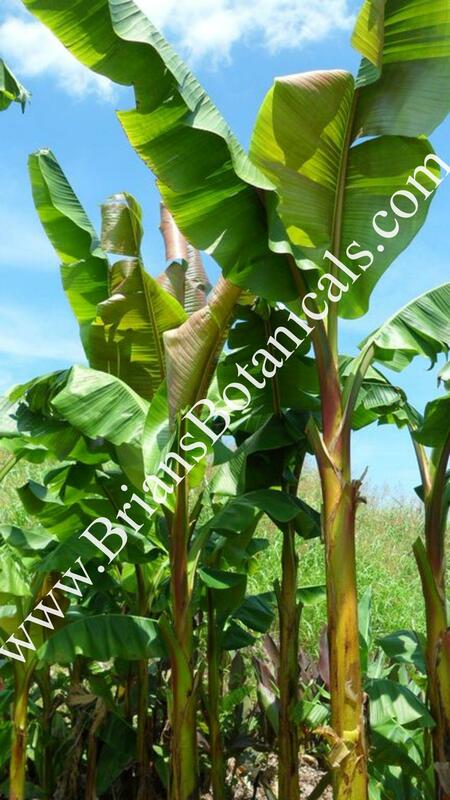 This banana also produces large rhizomes underground which is one of the main reasons it is so hardy. Plants are barerooted and around 1 foot tall trunk removed. The base is around softball size or more. Zone: 6 and up. Must be protected in colder zones with leaf or mulch compost. Large Bare-rooted plants. We dig these up to order. Size can range from grapefruit to plate size depending on what is underground. Mature plants are 7 -10 feet tall before cut down and cleaned. 6-10 Recommend mulching in cold climates. Trunks cut and mulched up 6-12 inches depending. 7-10 feet clumps spread with age.